Lieut. Moss, in Command, Describes the Organization and Accessories of the Detachment – The Training and Instructions – What the Soldiers Will Carry – Their Arms and Ammunition – Expect to Make the Trip in Six Weeks Each Way – The Party are all Colored Men. Not many years ago the bicycle was looked upon as a mere toy, a kind of ‘dandy horse’ and the riders were regarded as fit subjects for pity. That time, however, is a thing of the past; the bicycle of today is a very important factor in our social and commercial life, and bids fair to figure conspicuously in the warfare of the future. France, Austria, Switzerland, England, Germany and other European powers have, of late years, devoted considerable attention to the bicycle as a machine for military purposes, resulting in its adoption as component parts of their armies. The bicycle has a number of advantages over the horse – it does not require much care, it needs no forage, it moves much faster over fair roads, it is not as conspicuous and can be hidden from sight more easily; it is noiseless and raises but little dust, and it is impossible to tell direction from its track. Furthermore, the fighting strength of a bicycle corps is not diminished by “horse-holders.” Under favorable conditions the bicycle is invaluable for courier work, scouting duty, road patroling, rapid reconnoissance, et. A bicycle corps as an adjunct to infantry or cavalry could render excellent service where speed rather than number is required, such as taking possession of passes, bridges and strong places ahead of the command and holding them until reinforcements could be gotten from the main body. On the other hand, in rainy weather, over bad roads, etc., the horse is superior. The very thought of the bicycle doing away with the cavalry altogether is ludicrous. Each has PECULIAR FUNCTIONS of its own – a particular field in which, under certain conditions, the one is superior to the other. The question therefore, which confronts us is: Should not a modern, up-to-date army have both, that it might avail itself of the advantages of the one or the other as the proper conditions present themselves? During the last few years a number of experiments have been made in this country by officers, both of the regular Army and the National guard–nearly all of them, however, being tests of rapidity. With the exception of the work done last summer by the Twenty-fifth United States Infantry Bicycle corps, little or nothing has been done in testing the wheel as a means of transportation. Although equipped with ordinary roadsters taken from the general stock, carrying our cooking utensils in a crude way, not properly equipped with frame cases, luggage carriers, etc., and not having the advantage of experience, we made one trip of 800 miles at an average rate of six miles per hour. The greater part of the distance traveled was over some of the worst roads in the United States, through mud, water, rain, snow and sand; crossing and recrossing mountain ranges and fording streams; carrying our arms, ammunition, rations, tents, blankets, extra underwear, medicines, tools, repairing material, cooking utensils and extra bicycle parts. THE PROPOSED TRIP: Upon the recommendation and approval of Gen. Miles, “the patron of military cycling,” the Secretary of War has granted authority for the Twenty-fifth United States infantry bicycle corps to make a trip from Fort Missoula, Mont., to St. Louis, Mo, and return, a total distance of about 3000 miles. The trial of bicycles by the 25th Infantry in 1897 was an important historic event for various reasons, primarily because of the involvement of an African-American regiment. Like the rest of society at this time, the American army was segregated. Furthermore, its black troops were stationed in out of the way locations, and the American public were not generally aware of their existence. Major Taylor, the famous black world champion cyclist, was starting to win world records during 1897-98. Bantamweight boxer George Dixon was the first world champion black athlete (his title fights were in 1890-91), and Taylor was the second black world champion. Soon after the 25th U.S Infantry Bicycle Corps journey, war broke out between America and Spain, and the cycle corps was disbanded. Various black American units were amalgamated and sent to Cuba. The official reason for sending black troops was the belief that they might be immune to tropical diseases. They were first stationed in the southern states for training and acclimatisation where they experienced much resentment and prejudice from the locals. African-American soldiers were active in all the Cuba campaigns and they were commended for their courage and endurance. Their bravery and dedicated service were widely reported and, at first, some believed that the high praise they earned would result in better acceptance of African-Americans in society. But southern whites were appalled by the acclaim heaped upon the soldiers and reacted with violence. The formation of the 25th U.S Infantry Bicycle Corps was the first official endorsement of bicycles by the U.S Army. Colonel Pope had been trying to get the Army to adopt militarised versions of Columbia bicycles since the early 1890s; various militias bought them, but the Army, whose policy was invariably influenced by cavalry officers, resisted military use of bicycles. 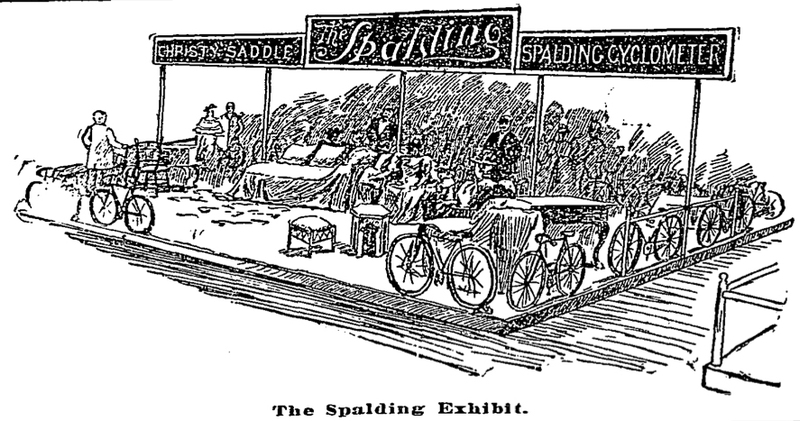 It must have been galling to Colonel Pope that the first official trial of military bicycles involved A.G Spalding, one of his main competitors. Posed photos show the Spalding bicycles with chainwheels exposed (extract below) but photos of the actual expedition show chaincases fitted. So this photo presumably predates the 3800 mile journey. The Spalding ‘Special’ had a different front fork than other Spalding models. There was a choice of two Spalding chainwheels (sprockets). This example is fitted with the larger chainwheel as illustrated in the 1897 catalogue (above). The bicycles shown in the 25th Infantry photos display the smaller Spalding chainwheel, probably because they were subsequently fitted with chaincases. THE PROPOSED TRIP: Upon the recommendation and approval of Gen. Miles, “the patron of military cycling,” the Secretary of War has granted authority for the Twenty-fifth United States infantry bicycle corps to make a trip from Fort Missoula, Mont., to St. Louis, Mo., and return, a total distance of about 3000 miles. ORGANIZATION OF THE CORPS: The corps consists of one surgeon, one sergeant, two corporals, one trumpeter and sixteen privates, commanded by myself–total, 22. It is divided into two squads, with the corporals as chiefs of squad and the sergeant as acting first sergeant of the corps. The heaviest man, stripped, tips the scales at 177, and the lightest at 125 1/2, the average weight being 148 1/2. The oldest soldier is 39 1/4 years of age and the youngest 24, the average age being 27. The men, with the exception of three or four who have just learned to ride, are all cyclists of more or less experience. They have been selected on account of their knowledge of cycling and their reliability, from among the four companies at this post. THE SURGEON: Dr. James M. Kennedy, the surgeon who will accompany the expedition, is a typical South Carolinian, who entered the service four years ago. He is 32 years of age, and being one of the finest young surgeons in the army, an enthusiastic wheelman and a fine speciman of manhood, he is in every way fitted to fill his new position. THE TRAINING: We are not “training” in the ordinary acceptation of the term — i.e., regulating the diet, abstinence from tobacco, etc. For several days in the morning and in the afternoon, we took walking exercises for an hour or more. For the last few days we have been making practice rides on our wheels, gradually increasing the distance from day to day, and starting out nearer to noon each succeeding day, in order to get accustomed to the heat. THE INSTRUCTION: A number of lectures have been given the corps on the construction of bicycles, their care, the functions of various parts and their nomenclature. Indeed, the infantry cyclist should know as much about his bicycle as the cavalryman knows about his horse. Practical instruction is also being given in taking apart and assembling bicycles, repairing punctured tires, etc. THE EQUIPMENT: The Corps is equipped with Spaulding military bicycles which have been especially made for the trip. The rims are of steel, the front wheels have 40 tandem spokes and the side forks and crown are extra heavy. The bicycles are all supplied with gear cases, luggage carriers, brakes and frame cases and weigh about 32 pounds (the heavy tires increase their weight considerably). Particular attention has been given the subject of tires and the wheels are furnished with eight different kinds of so-called non-puncturable tires, several pair having been especially made for the expedition. Some of these tires weigh as much as six pounds per pair. The cooking utensils consist of three telescopic frame cases made of light sheet iron, and two tin coffee pots. By means of thumbscrews the metallic cases are secured in the diamond of the bicycles and are used as ration carriers during the day; when camp is made the rations are taken out, and each case being made of two seperate parts we have six cooking vessels. The coffee pots are cylindrical in shape, measuring eighteen inches in length and ten inches in diameter. They are strapped to the handle bars on the front of the bicycle and a blanket roll is carried in each. WHAT THE SOLDIERS WILL CARRY: Every soldier will carry one blanket, one shelter tent half and poles, one handkerchief, one knife, fork, spoon, cup and tin plate, toilet paper, tooth brush and powder. Every other man will take along one towel, one bicycle wiping cloth and one cake soap. Each chief of squad will carry one comb, one brush, and one box matches. MEDICINES, TOOLS, REPAIRING MATERIALS, etc: The surgeon will carry a supply of medicine, case of surgical instruments, bandages, etc., the Corps will carry a complete outfit of repairing tools, oil, tire and rim cement, chain lubricant, extra tires, rims, spokes, cones, axles, pedal cranks, etc. ARMS AND AMMUNITION: Every soldier will carry a rifle, belt and fifty rounds of ammunition. The rifles will be slung across the back. THE UNIFORM: The uniform will consist of knickerbocker canvas trousers of a dead grass color, blue gingham shirts, and the regulation blouse, campaign hat, leggings and shoes. The uniform is one of durability rather than one of looks. THE SYSTEM OF PACKING: The blanket roll, which consists of one blanket, one shelter tent half and poles, one summer undershirt, one pair drawers, two pair socks, one handkerchief, tooth brush and powder, is carried in a luggage carrier in front of the handle bars. The roll weighs about ten pounds. The average weight of the bicycles, packed, will be about 55 pounds. Bacon will be cut into small chunks and wrapped in cloth. The coffee, sugar and flower will be carried in rubber cloth bags about eighteen by five inches. All the rations will be carried in frame cases. WHY ST. LOUIS WAS SELECTED AS THE OBJECTIVE: As the object of the trip is to test most thoroughly the bicycles as a means of transportation for troops, the route should be long and the geography of the country of such a nature as to afford all possible conditions. By selecting St. Louis as our objective, we have a long route with high and low altitudes; stoney roads of mountains; the hummoc earth roads of South Dakota; the sandy roads of Nebraska and the clay roads of Missouri. We are going to practically follow the Northern Pacific as far as Billings, Montana and the Burlington the rest of the way. It is of course, impossible to state exactly or even within several days the time it will take to reach St. Louis. However, if we do not encounter any rainstorms and headwinds, we expect to reach St. Louis in six weeks. We will leave Fort Missoula about June 14th. An 1894 American tariff on sugar imports hurt the Cuban economy, and ‘insurrectos’ began a revolt against the ruling Spanish colonial regime. Spain sent General ‘Butcher’ Weyler to the island, and put most of the population into concentration camps. American businessmen had interests in Cuba and the American Press agitated against Spain. After President McKinley came to office in 1897, the US dispatched the USS Maine to Cuba to rescue American citizens caught in the conflict. On 5th February, 1898, the Maine mysteriously blew up, and in April both Spain and America declared war. The US passed the ‘Teller Amendment’ promising Cuban independence. On the orders of Assistant Naval Secretary Theodore Roosevelt, Commodore Dewey immediately attacked Manila harbor in the Philippines. On 1st May, Dewey destroyed the old, decrepit, and rotting Spanish fleet at Manila, and the US prepared for an invasion of the Philippines. The US also invaded Guam and Puerto Rico, other Spanish island colonies, during the war. Under the leadership of General William R. Shafter, the US ground effort in Cuba was far from organized. Nonetheless, success was never in much doubt and the US defeated the Spanish with relatively little difficulty. On 10th December, 1898, the Treaty of Paris was signed, ending the war, and Cuba, Puerto Rico, Guam, and the Philippines became American colonies. After the war, the US made improvements in Cuban infrastructure and educational systems, and prepared to leave. But before leaving, the US forced the Cubans to insert the Platt Amendment into their constitution, which gave the US a military base on the island (Guantanamo). Guam, Puerto Rico and the Philippines became American protectorates, whose people, as the Insular Cases by the Supreme Court found, did not have full rights as American citizens. Some of the people in these new colonies were understandably upset, since they expected that they would be liberated just as Cuba had. Instead, the US kept the island colonies as coaling stations for its ships. Immediately after being annexed by the US, in January 1899 the Filipinos declared themselves independent, beginning a guerilla war against the US, led by Emilio Aguinaldo. The rebellion lasted over a year, until March of 1901, when the US captured Aguinaldo. A week later, the expeditionary force launched a two-pronged attack intended to secure the outpost at El Caney and the entrenchments on San Juan Hill. The two forces were to gain their objectives and join together for the final assault on Santiago. Troopers from the 25th Infantry acquitted themselves well at El Caney and were among the first to reach the outpost after heavy fighting. Meanwhile, the 24th Infantry and the 9th and 10th Cavalry regiments were establishing a reputation for ‘themselves as fighting men’ at San Juan Hill once more in the shadow of the more heralded, but no more effective, Rough Riders. As the Rough Riders advanced up San Juan Hill they found themselves attacked from all sides and in great danger of being cut to pieces. ‘If it hadn’t been for the black cavalry, the Rough Riders would have been exterminated.’ Five black soldiers of the 10th Cavalry received the Medal of Honor and 25 other black soldiers were awarded the Certificate of Merit. Famous showman William ‘Buffalo Bill’ Cody had expanded the name of his wild west show for the 1893 Columbia Exposition to ‘Buffalo Bill’s Wild West and Congress of Rough Riders of the World’ and the name ‘Rough Riders’ was used for the 1st U.S Volunteer Cavalry, one of three regiments enlisted in 1898 to make up for the shortfall of soldiers due to the Civil War thirty years earlier. The unit comprised college athletes, ranchers, cowboys, gold miners, gamblers, hunters, Native Americans, police officers and military veterans; by selecting men from Arizona, New Mexico, Oklahoma and Texas it was hoped they would cope more easily with the Cuban climate. Future U.S president Theodore Roosevelt was initially second in command, but subsequently led the regiment, which therefore became ‘Roosevelt’s Rough Riders.’ The regiment wore a cowboy version of the normal cavalry uniform, and became the epitome of America’s public image. The Press showed Northerners and Southerners, blacks and whites, fighting against a common enemy in the hope of healing scars left by the Civil War. But with its appearance and charisma, plus Roosevelt’s skill at publicity and self-promotion, much greater coverage was subsequently given to the ‘Rough Riders’ than the Buffalo Soldiers. FIRST U.S MILITARY USE OF BICYCLES IN WAR? At the end of the Spanish-American War, in 1898, the United States occupied Cuba. Rioting mobs in the street, along with outbreaks of malaria and yellow fever, created havoc in the country. Lieutenant James Moss was sent with his troops to maintain order; they were successful. The unique thing about Moss’s 25th Infantry of only 100 men was that they were a bicycle corps — they all rode bicycles, they were all black, and they never once used their weapons while in Cuba. However, this account is untrue. Contemporary American newspapers’ ‘yellow journalism’ – embellishment and glorification – was notorious: their influence on public opinion had been instrumental in helping the American government declare war on Spain. Although the Americans did not send bicycles to Cuba with the Buffalo Soldiers for the ten-week war, American cycle exports were strong at this time and Cuba did already have many American bicycles. America reneged on its initial promises of Cuban independence (receiving Guantanamo Bay as a permanent naval base) and after the war American bicycle exports to Cuba increased dramatically. So, with the bicycle prevalent as a means of transportation, it would obviously have seen service in various ways during the war, to assist civilians fleeing the fighting and as transportation for local fighters. Though bicycles were used in European wars since 1870, the first armies to use the bicycle extensively in war were the Boer Kommando and British army in 1899 during the 2nd Boer war. But in the ‘Jameson Raid’ of January 1896, which precipitated the Boer war, a British soldier and his Boer colleague famously rode bicycles through Boer lines on a spying mission and with dispatches for the British commander concealed under the saddle pin. As the war progressed many African American soldiers increasingly felt they were being used in an unjust racial war. The Filipino insurgents subjected Black soldiers to psychological warfare, using propaganda encouraging them to desert. Posters and leaflets addressed to ‘The Colored American Soldier’ described the lynching and discrimination against Blacks in the United States and discouraged them from being the instrument of their white masters’ ambitions to oppress another ‘people of color.’ Blacks who deserted to the Filipino nationalist cause would be welcomed and given positions of responsibility. During the war in the Philippines, fifteen U.S. soldiers, six of them Black, would defect to Aquinaldo. One of the Black deserters, Private David Fagen became notorious as a ‘Insurecto Captain,’ and was apparently so successful fighting American soldiers that a price of $600 was placed on his head. The bounty was collected by a Filipino defector who brought in Fagen’s decomposed head. Despite the Buffalo Soldiers’ impressive war record, black soldiers were not treated well when in the southern states of the USA, in keeping with the racist attitudes of the era. After their service in Cuba, they were among the 126,000 American troops sent to the Philippines to fight the guerrilla war there. Many American soldiers noted the irony of entering the war to help Cubans fight for independence while simultaneously suppressing Filipino independence. Black soldiers also found themselves fighting black Filipinos. The Philippine ‘Republic of Negros’ had won independence from Spain in 1898 – by forcing Spanish surrender after attacking with imitation weapons such as rifles carved from palm fronds and cannons of rolled bamboo mats. Though it was initially recognised by America as a separate state, it was annexed in 1901. The Filipinos had expected to be granted independence after America gained the country from Spain; but America had instead created its own colonial empire. As a result of the Philippine-American War, an estimated 400,000 ‘insurrectos’ died under American fire, and an even greater number of civilians were killed (estimated figures of one million are probably not an exaggeration, as there are records of 300,000 being killed in just one area). Although the war officially ended in 1902, guerrilla resistance continued until 1936. Due to the horrific slaughter of islanders by American soldiers, the war was often described as a genocide. Though America brought a much more democratic style of education to the Philippines, the writing of its history was strictly controlled, and the story of the Philippine Republic and its struggles for independence was suppressed. Generations of Filipinos and Americans grew up learning very little about this war. Is it right that a dirty Kaffir [native] should walk on the pavement without a pass? That’s what they do in your British colonies. Brother! Equal! Ugh! Free! Not a bit. We know how to treat Kaffirs …They were put here by God Almighty to work for us. We’ll stand no damned nonsense from them. We’ll keep them in their proper places. Is it perhaps that there are two kinds of Civilization – one for home consumption and one for the heathen market? In the context of this article on the Buffalo Soldiers, a relevant point is that Filipinos were ‘de-humanised’ in the eyes of American soldiers in the Philippines. This is common military practice but also the essence of racism. The army’s treatment of Filipinos as ‘savages’ was no different than American southern whites’ attitude toward Afro-Americans. De-humanization allowed the perpetrators to justify the ill-treatment of their victims, either to kill them en masse (Philippines) or to enslave a population (America). Shortly after the end of the Spanish-American War a decline began in the status of Black serviceman. White sentiment ran against Black soldiers; too much apparently had been made of their success, causing them to forget their subservient ‘place.’ Even Theodore Roosevelt, who had been a supporter of Black soldiers, reversing his earlier praise, stated that Black soldiers were peculiarly dependent upon their white officers and Black noncommissioned officers generally lacked the ability to command and handle the men like the best classes of whites. Roosevelt apparently was bowing to the pressures of public opinion. A.G. Spalding was a sporting goods company from Chicopee Falls, Massachusetts. In the mid-1890s, they claimed to be America’s leading bicycle manufacturer. (Columbia made an identical claim). They marketed the renowned Christy Anatomical saddle, the Spalding Cyclometer and other cycle accessories. The Model 1873 ‘Trapdoor’ Springfield was the first standard-issue breech-loading rifle adopted by the US army. The black powder Model 1873 continued to be the main service rifle of the U.S. Military until it was gradually replaced by the ‘Model 1892’ bolt-action rifle (based on the Norwegian Krag-Jørgensen action). Replacement began in 1892, but the Model 1873 was still used by secondary units during the Spanish-American War in Cuba and the Philippines, although it was at a major disadvantage against the Spanish forces armed with Spanish M93 Mauser bolt-action rifles using smokeless powder.